The École nationale supérieure des Beaux-Arts in Paris had a lot of influence on the movement. At the time Neoclassicism and Romanticism were the main movements at the school. With later art styles, especially that of impressionism, academic art losts its importance. 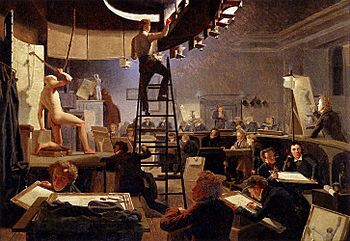 Well known artists who painted in the academic art style include William-Adolphe Bouguereau, Alexandre Cabanel, Eugene de Blaas, Edward Poynter, Wilhelm Bendz and Alexander Ivanov. Academic art Facts for Kids. Kiddle Encyclopedia.